Put PayGo POS to work for you. Our point-of-sale software provides independent retailers and restaurateurs like you with tools that can be tailored to do the things you want to do. Call us today 866-545-7047 or schedule an online demo now! Your only limit is what you don’t imagine. PayGo does a lot. More importantly, it can do a lot more. Meet up with one of our consultants to learn how you can do more than the retailer next door. We helped a wine store transform how wine is purchased. We helped a coffee shop automate the bean to the cup. We helped a consignment ski shop integrate and elevate. We even helped a wine bar in England deal with Brexit. Do you need help doing something special? We can help. 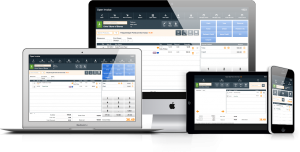 Need point of sale software with power and tweakability? PayGo provides independent wine & spirit retailers like you with the powerful, easy-to-use software tools you need to do the things you want to do. Keep your customers coming back to your store for more with a little help from PayGo's loyalty tracking, shopping cart integration, and marketing features. Track your customers, make modifications to their orders, and keep the line moving like an efficient money train. Track it all down to the last drop with super simplicity using PayGo's cafe and quick service friendly features. Did we not talk about your type of business? Well, we've done a lot for all kinds of retailers. Let's chat and see if we're right for you. "We would recommend PayGo to other small and medium size businesses that need something more from their POS system. The staff at PayGo understands the demands small businesses face." "[PayGo] is transforming how we do business, Salut changed the way that wine merchants do business in the UK, with most merchants copying our model." "I have frequent buyer programs that my customers love so much. [PayGo] auto-prints out their gift certificate. When they’re redeemed they vanish, so you don’t accidentally use them twice. No punch cards needed." We're really good at solving your unique retail problems. Jot it down and email it off to one of our trusty consultants. We'll get back to you in a jiffy with the details you need to make an informed decision. Take Credit Cards. Like Now! We integrate to help you be great. Click to learn more about how your store can hum.